Yes, first. I just have to offer some bookish suggestions about this historic and complicated week. Dr. Paul Samuelson died, the man who wrote one of the best selling textbooks of all time, an iconic scholar, writer, teacher and public intellectual who shaped how most people and certainly most scholars think about economics. He won the second Noble prize in economics in the early 70s and later trained a generation of important economists, including the now very influential Paul Krugman. For better or for worse—some think for worse—the legendary Mr. Samuelson and his legacy reminds us that ideas matter, that the narratives out of which we live, the myths that are guiding us like (evil?) spirits, have great, great consequence. When we opened our bookstore 28 years ago with a section called “worldview studies” and gave out copies of John Stott’s little paperback (still in print) Your Mind Matters, and brought in Brian Walsh to do a presentation on critiquing the idols and ideologies of our time, drawn from his A Transforming Vision: Developing a Christian Worldview, we were not kidding; morally serious people must grapple with ideas and imaginations and what Francis Schaeffer called “the flow of history.” It seems that few religious bookstores do this much. Whoever laughs about ivory tower intellectuals being obscure and irrelevant simply doesn’t have much spiritual discernment (and should ponder Mr. Samuelson’s knowing quote to the effect that he didn’t care who wrote the nations monetary policies or economic regulations as long as he wrote the textbooks; the one who writes the texts and teaches the rising generation of leaders obviously has the influence.) President Obama’s meeting with bailed out Wall Street leaders who seem to still be fighting regulations with high powered lobbyists doing their bidding yesterday, and Krugman’s scathing piece about it remind us that ideas and worldviews and the stories we tell, how we construe what matters, matter. Walsh’s most recent co-authored book, with Stephen Bouma-Predigar, last year’s heavy Beyond Homelessness: Christian Faith in a Culture of Displacement (Eerdmans; $24.00) may be the most important book of recent years, reminding us so passionately of how the gods of economism cause cultural displacement, real poverty and environmental devastation. (Did you know they cite Up in the Air, the fabulous Walter Kirn novel from which the brand new movie was made? It is about a jet-setting corporate guy who literal spends his days in what he calls Air World. Whew; talk about not having a sense of place!) Is there really a connection between the new flick by Clooney and the foibles of Copenhagen? You betcha! Beyond Homelessness shows just how post-modernity’s “home-less” “up in the air” culture leads to, or is a contributing factor of, economic and environmental devastation. And these relationships couldn’t be more urgent to explore. It is a truism that the gap between the rich and the poor continues to widen and if we ponder this vast truth, even for a moment, it can be seen as an ethical crisis to which our best theological and spiritual resources must be directed. The issues raised by the African and poorer nations delegation at the Summit are symbolic for me, another reminder that to be a decent contemporary person, we have to care what our neighbors in other parts of the world go through, and how they see things, and what they ask of us. I am glad that people from my denomination are at Copenhagen, as are representatives of most Christian traditions and denominations, from Anglican to evangelical to Roman Catholic and Orthodox, Presbyterian and Methodist. It is a stunning matter that so many of the third world nations walked out yesterday, and a sad, sad commentary on the hard complexities of these things. That some of the research about climate change has been doctored and certain influential labs now discredited hasn’t made the task of being responsible stewards or informed global citizens any easier, either. Surely there is a crisis on our hands, a crisis of science, of economics, of confidence and worldview, perhaps of truth itself. We live in complicated, serious times, and I hope BookNotes readers want to be wise and informed and well read on these things. Surely it will come up in your church or family or even at holiday parties these next weeks. I hope we offer prayers about this this week in church and at our family tables. And so, we would like to encourage you to read a bit in this whole matter of the relationship of environmental problems and global poverty and encourage others to do so, too. Brian McLaren has written a very important and readable book, Everything Must Change: When the World’s Biggest Problems and the Good News of Jesus Collide (Nelson; $14.95) that tries to show how reforming the engines driving the development of the most scary global concerns is our most pressing task. (By engines he means the values, the stories, the framing narratives, the faiths and assumptions, etc.) On one hand, his book is a call to public and personal evangelism, a call to announce a new way, the possibility of repentance, conversion, new values and new ways of living. Yes, Brian insists, the upside-down Kingdom of King Jesus has come, and we can be agents of His hope as we show how Biblical wisdom can be applied to the stories that mis-shape our world, deforming and driving unsustainable behavior. It is a book about turning from idols and raises questions that are all over the news this very week. I thank God that he wrote it, grateful to get to sell it on occasion, and offer appreciation for the publisher doing this kind of work. pleasant love for turtles, for instance, is legendary, although this is a watershed book, applying his global thinking (he has spent time in Africa in recent years) to this maze of inter-connected issues. His past critique of the ideologies of modernist rationalism and his explication of the centrality of the Kingdom of God in the Bible all comes together in a splendid, provocative, educated way. Here is our hope: that Everything Must Change become a conversation starter, a resource, a springboard to thinking and discussion, praying and organizing. So, here is our deal: buy one, and we’ll send you another absolutely free. We don’t make any money on this offer, but we have a lot of them in stock and are eager to get them into your hands. Buy one, get one. How’s that? Call it our little “Copenhagen special.” We hope many take us up on this (while supplies last.) Please don’t hesitate. I’d be remiss not to mention just a few others of the many we stock that might be relevant. Inheriting the Earth: Poor Communities and Environmental Renewal Don Brandt, editor (World Vision $14.99 This is an amazingly rich collection of piece by missionaries, NGOs, folks who work directly with the world’s poorest, Christian humanitarians who have direct insight about the relationship between these two huge issues. There are a few book likes this and this is one of the best. A moving forward by Ron Sider says that it “dares us to see beyond the political and to align with God’s intentions for creation.” Well done. Our Father’s World: Mobilizing the Church to Care for Creation Edward R. Brown (IVP) $15.00 A clear, evangelical, persuasive overview, beautiful and inspiring, altogether readable. Very highly recommended–one of the best batch of recent books that offer a clearly Biblical, church-oriented introduction. Yay. For the Beauty of the Earth: A Christian Vision for Creation Care Steve Bouma-Predigar (Baker Academic) $24.99 I have said numerous times that this is the very best book on a serious theology of creation care. Spectacularly insightful, powerfully written, very thoughtful, urgent and doxological. Steve is the co-author of Beyond Homelessness and has edited a volume of Joseph Sittler, the renowned Lutheran theologian of creation. The best! 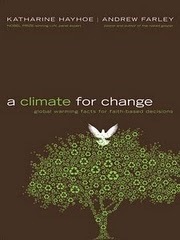 A Climate for Change: Global Warming Facts for Faith-Based Decisions Katherine Hayhoe & Andrew Farley (FaithWords) 22.99 This easy to read book is ideal for skeptics or beginners, calm, balanced and solid. One evangelical leader (himself in Copenhagen at the Summit even now) has said it is without a doubt his favorite book to recommend on this topic. A Nobel prize-winning geosciences scholar and a Baptist pastor. Well written and convincing and helpful. There is good attention paid to those who doubt the mainstream consensus, and this is important, valuable stuff. They are both obviously very well read making this a great resource. A Moral Climate: The Ethics of Global Warming Michael Northcott (Orbis) $20.00 As you may guess from the publisher, this is academic and demanding and radical. Bill McKibben notes that it is a “thorough look at the ethical and moral issues raised by the biggest thing human beings have ever done: rearrange the workings of the earth’s climate system.” The foreward is by Sir John Houghton. The author is Professor of Ethics at the University of Edinburgh and a priest in the Scottish Episcopal Church. What a great post, Byron. Thanks for all you do.